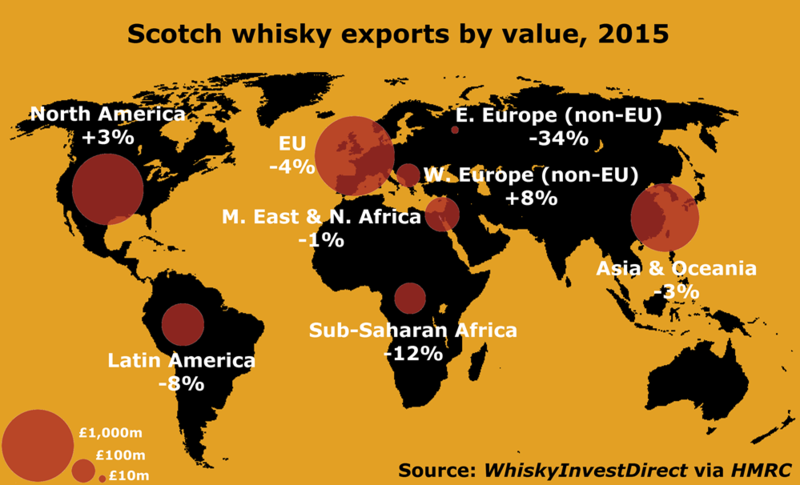 GLOBAL EXPORTS of Scotch whisky slipped to £3.85bn in 2015, write Rupert Patrick and Leon Kuebler at WhiskyInvestDirect, dropping 2.6% by value according to the latest UK trade data released by HMRC. That marked a significant improvement from 2014, when exports saw a sharp fall of 7.3%. This in turn came after the Scotch industry experienced a small 0.3% decline in 2013, ending a strong decade of export growth from 2004 onwards. The rate of decline also slowed across 2015, with figures for Q4 – historically the heaviest period for exports of Scotch, as Christmas and New Year approach – showing a dip of only 1.5% in value compared to the same period in 2014, which was notably stronger than the Q3 and Q2 declines of 2.9% and 4.2% respectively. Export prices held firm, with the full-year decline in export volumes slightly greater than the fall in value at 2.9%, down to the equivalent of 1.1 billion bottles. That means the price per litre of pure alcohol (the industry's standard accounting unit, also used by HMRC in its data) remained at 2014 levels. Most notably, more than 80% of last year's global drop in Scotch whisky exports came from Russia, Brazil and oil-producer markets, hit by the collapse in commodity prices. Between them, those three factors accounted for £84m of the £102m decline in value overall. Direct exports to Russia – which retaliated against EU sanctions over Crimea and Ukraine with trade barriers of its own – last year totalled only 2% of those achieved in 2013. Not a single bottle of blended Scotch whisky was shipped to Russia last year. Exports to key Russian-market suppliers Estonia and Latvia also fell, dropping 44%. No.1 consumer the United States held steady, while Canada and Mexico both saw double-digit growth. 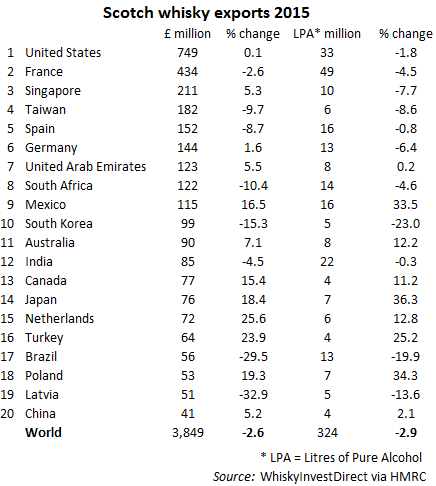 Germany, the 6th largest export market for Scotch by value, grew by 2%. Exports to mainland China and its three key supplier markets – Hong Kong, Macao and Singapore – rose by 3% overall. Overall, the 2.6% drop in Scotch exports during 2015 shows a better than expected performance, with the pace of decline slowing markedly from the previous year's 7.3%. The well-advertised downturn in Brazil and the virtual shutdown of shipments to Russia have been offset by very encouraging turnarounds in both North America and Western Europe. Today's broad base of solid consumer markets means neither the oil-price collapse nor the global economic slowdown is making a significant impact on the Scotch whisky industry's overall strength. Compared to 2014, exports of Scotch increased in 12 of the 20 largest markets, adding £102m by value, although the absolute figure was down by £27m thanks to the four biggest fallers – Brazil (-£24m), Latvia (-£23m), Taiwan (-£19m) & South Korea (-£17m). Of these, only South Korea has been showing a long-term decline in Scotch imports. Sales of blended Scotch meantime comprised 75.4% of all exports, slipping from 76.0% in 2014 and declining 3.4% by value to £2.90bn, while sales of single malt Scotch slipped 0.3% to £0.95bn. North America's turnaround, however, also saw shipments of blended Scotch jump ahead of Christmas and the New Year, with exports of bottled blends to Canada, the United States and Mexico rising 17% in the final quarter of 2015 compared to Q4 2014. Across 2015 as a whole, and also including all bulk shipments (ie, for bottling in the importing country), sales of blended Scotch to North America grew 3.8%, contrasting with the 15.5% drop of 2014 as supply lines were re-stocked.